Read as 'mee re-bush' not 're-bus'(as the big red bus). This is a Malay-Chinese influenced street food. 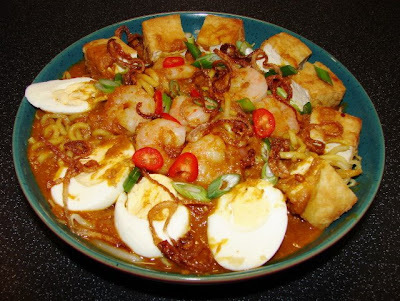 It is a colourful noodle dish with a sweet potatoes and ground peanuts spicy gravy garnished with all sorts like fried tofu, cooked prawns, hard boiled eggs etc... delicious comfort food and very filling. To make this noodles first is to make the gravy, once you have done that everything else is easy, to make life easier I always double the quantity and keep the other half of the cooked paste in the fridge will keep for few weeks and I can have this noodles within half hour prep. Try to find ready cooked thick yellow Chinese (Hokkien) noodles from the chiller section which look like spaghetti if you can, if not use normal spaghetti or supermarket ready cooked egg noodles. I find supermarket egg noodles too soft, kind of mushy. De-stalk and de-seed the dried chillies, then soak in hand hot water till soft. Soak the dried shrimps with warm water till they are slightly softened leave the soaked liquid for the gravy. Cut off about 10cm of the top of lemon grass and about 1 cm of the root part, then remove 1 - 2 layers of the fibrous outer layers. Then cut the lemon grass into paper thin rings. Cut all the other spices into small pieces. Put all ingredients into a mini blender and blitz till you get a very smooth paste. If the blender is struggling add some water and blitz again. Heat the wok or deep pan with oil, then add in the spice paste and stir most of the time to prevent paste sticking. Fried the paste for about 10 minutes or till the paste has changed to dark brownish red and thickened. b. Gravy and preparation of the noodles dish - this recipe enough to feed 3 - 4 persons. Cut sweet potatoes into chunks and measure around 600 ml of water and boil the potatoes till cooked. Take them out and mashed. Using the same potato boiling liquid, poach the shelled prawns for till cooked or wheen they turned pink and opaque. Remove the prawns, covered and leave aside. Measure the cooking liquid and add in the dried shrimp soaking water, you need around 800ml in total if not enough top up with water. Blitz the peanuts in a blender till quite fine but not turning into peanut butter. Boil the liquid in a stock pot or wok, add in the fried rempah and mashed potatoes, add in kecap manis, soy sauce and enough salt to taste, let this simmer for about 10 minutes. Then add in finely ground peanuts. Stir till all combined and heat till just boiling. The gravy should be ready to use. The gravy should not be too thick or the noodles could look gloopy. Let this keep warm. Season the tofu with a pinch of salt then coat with a dusting of plain flour and shallow fried till brown and crispy. Cut into bite size. Quickly blanch the noodles, bean sprouts and celery. Put them on noodle bowls. If you use spaghetti cook as per instruction. Pour in enough gravy. Top with tofu pieces, boiled egg, cooked prawns and a sprinkling of spring onion, chillies and fried shallots. Put a wedge of lime/lemon and a dollop of sambal belacan on the noodles or in a small sauce dish to go with the noodles. Thank you Christine for the feedback. It's been such a long time since I wrote this and I did not really check the text. Just found a few errors and had them corrected. Hope that did not confuse you.